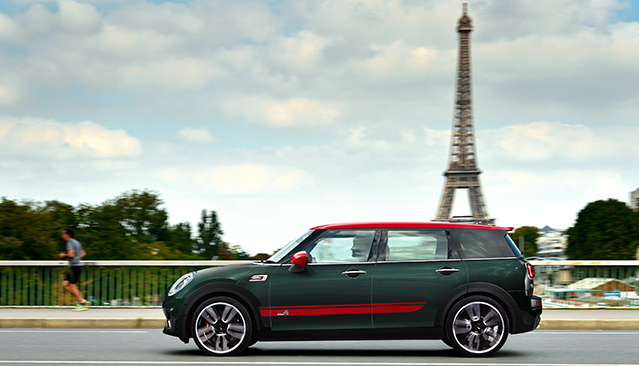 ALL-ROUND GUTSY: THE UNVEILING OF THE NEW MINI JOHN COOPER WORKS CLUBMAN AT THE PARIS MOTOR SHOW 2016. Buckle up. The latest model generation of the MINI is now providing irresistible driving fun on a scale like never before. The selection of John Cooper Works models was recently extended to include a new top athlete which will generate more enthusiasm for the characteristic race feeling that you can expect only from MINI. Presenting the new MINI John Cooper Works Clubman – a turbocharged masterpiece which saw its world premiere at the 2016 Paris Motor Show. This latest extreme athlete is also the biggest of its kind in the MINI portfolio. Its captivating temperament is combined with excellent showings in the disciplines of space, versatility and suitability for long-distance driving, thereby creating added diversity within the range of John Cooper Works models. After the successful launch of the new MINI John Cooper Works with the classic three-door body shape and the new MINI John Cooper Works Convertible for highly turbulent open-air driving fun, the new MINI John Cooper Works Clubman is now presented as an all-round talent able to handle the wide-ranging demands of day-to-day traffic as well as the challenges of race track driving. Fitted with the most powerful engine ever in a MINI, the standard all-wheel drive system ALL4, a suspension technology geared towards the very highest performance qualities as well as exclusive design features and fittings, it is clearly distinguished from the other model variants of the new MINI Clubman. In addition to this, the current MINI model range for the small car segment was also presented to trade fair visitors in the French capital from October 1 – 16, 2016. Alongside the new MINI Convertible, it was the new MINI Seven that particularly took centre stage at the venue. The first design model of the new generation is available both as a MINI 3-Door and a MINI 5-Door, combining its modern premium characteristics with a sense of tradition and individual style.